We’re not a food blog, but this is worth the exception! 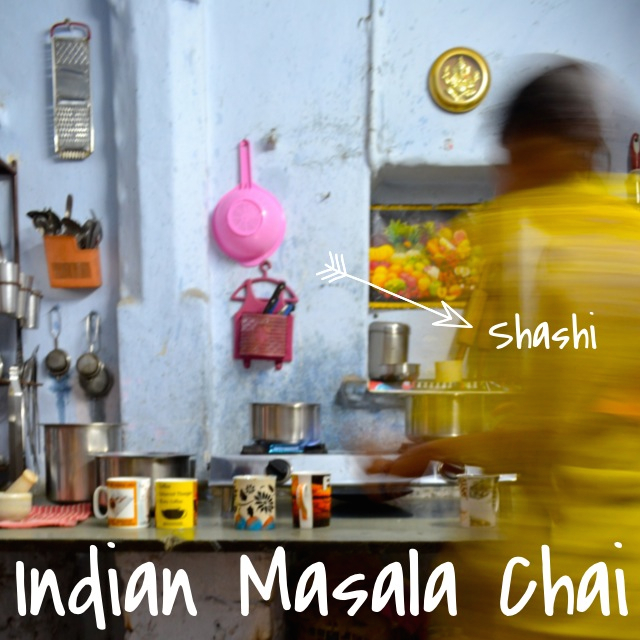 Shashi, the lady who taught us how to make true Indian masala chai, is quite the survivor. After welcoming us into her tiny abode, we realised she isn’t just a whizz in the kichen, but a woman with a story of tragedy, fate and resilience. After dealing with the unexpected death of her husband and having two young children to raise and educate, Shashi began teaching what she knows best, traditional Indian recipes. Without knowing a word of English, she began passing on these time-honoured recipes, with the help of travelers to translate. Through years of teaching in her kitchen, Shashi learnt to speak six different languages and now has a thriving business in the heart of magical Udaipur. We certainly didn’t expect this inspiring story when we signed up for a cooking class! After experiencing the warmth of this amazing woman and her home, I feel like I’m passing down my grandma’s much loved recipe here… So cherish it because it really is worth cherishing. Grind the cardamon, peppercorns and ginger in a mortar and pestle. Put all ingredients – milk, water, sugar, tea leaves, ground spices, basil and nutmeg – into a small saucepan and bring to the boil, simmering for about 5 minutes. The chai will start to become a coffee brown colour and should become aromatic. When the chai is ready, strain the liquid into a cup and enjoy! A simpler way of making chai ya masala (masala tea in swahili but with chai borrowed from the indian coolies who came to kenya in the 1800s to build the railway all the way to uganda thus making kenya their home for generations to come) is simply buying tea masala. Put water depending on how many cups will be enough, 1 cup of milk and majani (tea leaves) in a cooking pot. When it begins to boil, put about half a tea spoon of masala and stir to mix. Let them boil together for a while But not so long. After your tea is ready, sieve it into a jug,flask or cup to drink. Make sure you don’t put lots of masala because it will end up being bitter. Just felt like sharing the Kenyan version of masala tea. Thanks for the tip and sharing this method! I will have to try it out!